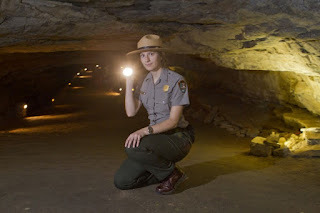 from Louisville, is a park ranger at Mammoth Cave National Park. Over 150 years ago, the limestone hollows and intricate mazes routed by gypsum-encrusted hallways housed a tuberculosis hospital. Louisville native John Croghan believed that the vapors from the cave would cure patients of the epidemic. This is just one interesting fact that Louisville junior Celia Baker said she’s learned since working at Mammoth Cave National Park, the longest cave system known in the world. Baker took a position as a tour guide last summer after she noticed a flier in Snell Hall. Ironically, she’d never been to Mammoth Cave before she started college. During the two-week training program, Baker learned different aspects about giving tours, from CPR First Aid to interesting places to stop during tours. Each guide is required to design their own route. Baker said the tours aren’t made up for them. Each guide plans a tour and presents it to be approved. One of her favorite spots in the cave is the beginning of the New Entrance tour. Tourists trek down 280 steps to a striking view of Grand Central Station, one of the cave’s most photographed landmarks. Mammoth Cave offers a variety of tours each season for children, adults and the biggest caving enthusiasts. The Wild Cave tour features free cave-wall climbs and hand-and-knee crawls through rocks, dirt and wet terrain. Mammoth Cave Adventures, a privately-owned entity, offers other attractions such as a zip-lining tour, a super swing and horseback riding. Bowling Green senior Kari McConnell started working as a zip line instructor last month. “My boyfriend and I went zip-lining at the cave, and I fell in love with it,” McConnell said. This summer, she will serve as an intern and help build the park’s newest attraction called the Power Fan, a 90-foot building where tourists dive off wearing a harness toward the fan while suspended in the air. “It’s kind of a Spider-Man-like thing,” she said. McConnell, who is a recreation major, said she’s always been interested in the outdoors. Growing up, she loved to go canoeing, hiking and kayaking with her mom. She changed her major to recreation after she participated in the outdoor leadership program on campus. McConnell likes that she meets so many different people by working at Mammoth Cave Adventures. Baker said caving could even be a good weekend trip for other college students. “The Wild Cave tour would be a really cool one for students who want to be adventurous,” she said. Most tour prices range from $5-24. The Wild Cave tour is $48. Zip-lining tours, which include the giant super swing, are one hour long and priced at $55. One-hour horseback riding sessions are $25 per person. After graduating this May, McConnell wants to get her master’s degree and pursue therapeutic recreation. She said she’s excited to keep working at Mammoth Cave Adventures. “I’ll be there as long as they’ll have me,” she said.